We would like to introduce ourselves. 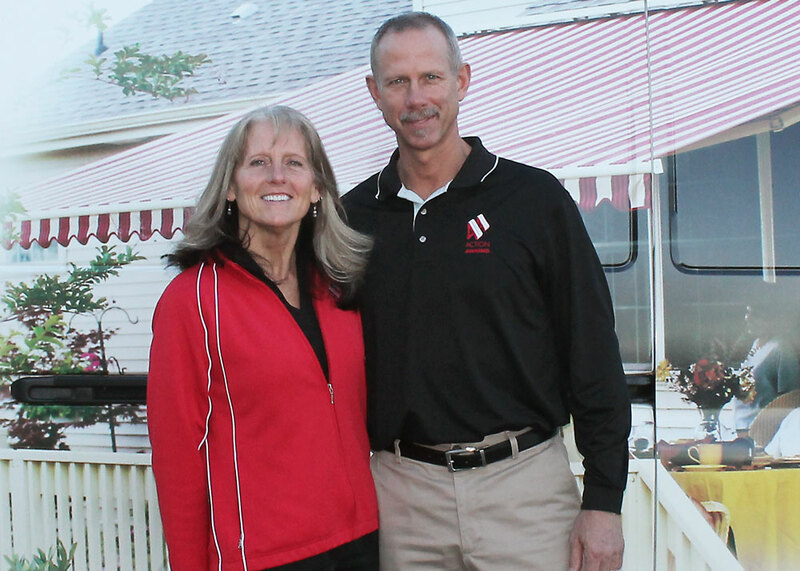 We’re Bruce and Joyce Beukema, the owners of Action Awning, LLC. Action Awning is a family owned and operated business, proudly shading West Michigan for over 10 years. It is our pleasure to provide our clients with the highest quality service and professional shading experience. We have an impressive list of hundreds of clients ready to recommend Action Awning for all of your shading needs! At Action Awning, your local independent Durasol and Eclipse representative, we have a reputation for offering the finest products and backing them up with impeccable service. For that reason, we are proud of our affiliation with Eclipse Shade Systems and Durasol Awnings. Together, Durasol and Eclipse bring more than 54 years of awning production and innovation to the consumer. We have been consistently impressed with how both companies match our dedication to excellence and professionalism. As a family-owned business, we have chosen to only provide products that we can stand behind with confidence. An Action Awning experience brings a high degree of satisfaction to our clients. When you choose Action Awning for your project, you’ll work directly with us from initial contact through installation—no third-party installers. All of our products are custom made, and carry the best warranties in the industry including a 5-year labor warranty. Installations are customized to each project. We are, and will continue to be, the most experienced West Michigan dealer for the world’s finest solar screens and retractable patio, deck, and window awnings. We sell only the highest quality awnings and screens available, fully installed and ready to provide you, your guests, and your home with years of comfort and protection from the sun and rain. We know you’re busy, and trying to choose from hundreds of fabric options while in a showroom is difficult at best. That’s why we come to you! We’ll provide an expert, no-obligation consultation and help you design a shading system that combines form and function to your home or business. By coming to you, we’re able to evaluate your needs and evaluate where you intend to have your awning or shade installed. Using this information, we put our experience and factory trained knowledge to work to help you choose the best product, fabric, and options for your needs. From their new office in Wayland, Action Awning was featured on the popular eightWest show on WOOD TV in June 2018. Watch as Bruce and Joyce talk with Terri DeBoer about their products and the many options available. Ready to get started on your project? The first step is to contact us and schedule a free, no-obligation appointment.